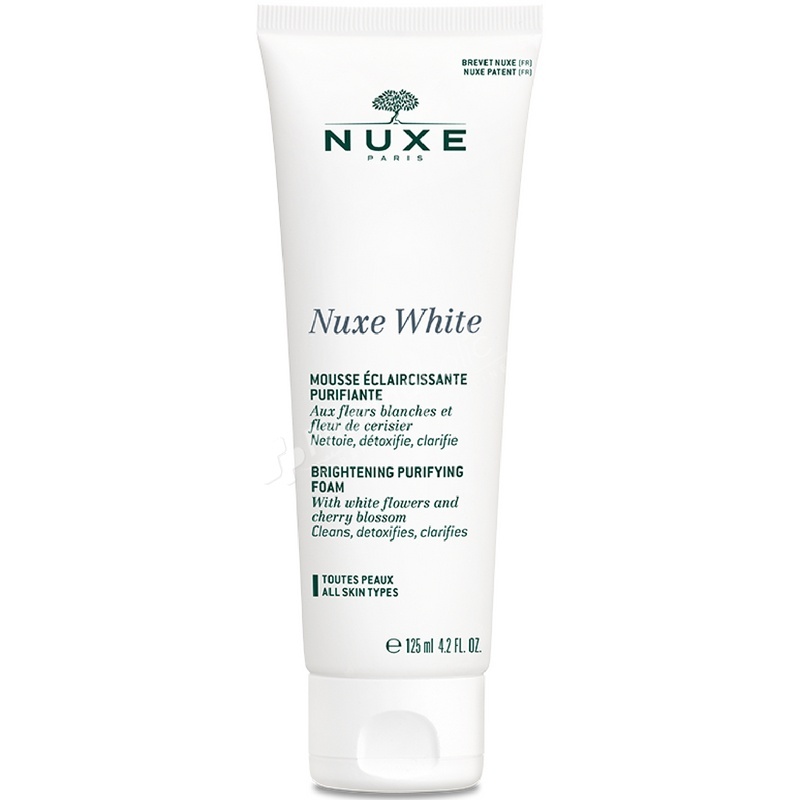 Nuxe White Brightening Purifying Foam is a gentle foaming cleanser that cleanses the skin and eliminates impurities and excess sebum without drying it out. Thanks to the combined power of White Crocus, Stargazer Lily and Vitamin C, the skin is brightened and the radiance of the skin is enhanced. The skin is left supple and purified with a youthful look. Apply morning and night to damp face and neck. Massage in light circular motions, then rinse with water. AQUA/WATER, GLYCERIN, SODIUM LAUROYL SARCOSINATE, COCO-GLUCOSIDE, GLYCERYL OLEATE, SODIUM COCOAMPHOACETATE, ACRYLATES/C10-30 ALKYL ACRYLATE CROSSPOLYMER, STYRENE/ACRYLATES COPOLYMER, LAURYL GLUCOSIDE, PARFUM/FRAGRANCE, BENZYL ALCOHOL, LEVULINIC ACID, SODIUM COCOYL GLUTAMATE, SODIUM LAURYL GLUCOSE CARBOXYLATE, SODIUM HYDROXIDE, CITRIC ACID, SODIUM LEVULINATE, ASCORBYL GLUCOSIDE, TETRASODIUM EDTA, DEHYDROACETIC ACID, BUTYLENE GLYCOL, PRUNUS SERRULATA FLOWER EXTRACT, SODIUM CITRATE, BENZOIC ACID, SUCROSE, CROCUS SATIVUS FLOWER EXTRACT, HYDROGENATED PALM GLYCERIDES CITRATE, TOCOPHEROL, PANCRATIUM MARITIMUM EXTRACT, SODIUM METABISULFITE [N2804/A].